Biotechnologists, physicists, and medical researchers at Friedrich-Alexander-Universität Erlangen-Nürnberg (FAU) have developed technology for microscopic imaging in living organisms. A miniaturised multi-photon microscope, which could be used in an endoscope in future, excites the body's own molecules to illuminate and enables cells and tissue structures to be imaged without the use of synthetic contrast agents. The findings have now been published in the renowned journal Advanced Science. It is often necessary to examine tissue samples under the microscope to diagnose diseases. This involves taking such samples using colonoscopy, for example, and applying contrast agents to distinguish different types of tissue effectively. Biotechnologists, physicists and medical researchers at FAU have now developed a process that could greatly simplify examinations of the colon and other organs. 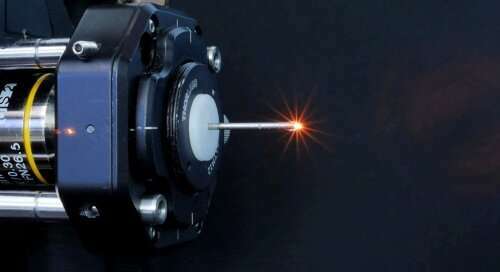 They have miniaturised multi-photon microscopy to such an extent as to enable it to be used in endoscopes. "A multi-photon microscope emits focussed laser pulses at very high intensity for an extremely short period of time," explains Prof. Dr. Dr. Oliver Friedrich from the Chair of Medical Biotechnology. "During this process, two or more photons interact simultaneously with certain molecules in the body which then makes the molecules illuminate." Multi-photon microscopy offers decisive advantages over conventional methods. Patients do not need to take synthetic contrast agents for the imaging of parts of connective tissue as the body's own markers illuminate due to the excitation by photons. In addition, the multi-photon laser penetrates deep into cells, for example into the walls of the colon, and provides high-resolution three-dimensional images of living tissue, whereas conventional colonoscopy is restricted to images of the surface of the colon. The procedure could supplement biopsies or even make them superfluous in some cases. In current experiments on small animals, the light emitted from the laser is transmitted via a rigid system. More research is needed to integrate the system into an endoscope. "Special photonic crystal fibres are required to guide the laser pulses," says Friedrich. "Furthermore, in addition to the objective lens, the entire scanning mechanism must be miniaturised to allow it to be integrated into a flexible endoscope." Multi-photon microendoscopy is not only useful for examining the colon. It could also be used in other areas of the body such as in the mouth and throat or in the bladder. The aim of the new method is to enable the doctor to detect whether organ cells and parts of the cell wall have changed on the micrometre scale. Complex dyeing processes and time-consuming biopsies can thus be limited. Prof. Friedrich's team aim to provide doctors with an image database providing a multi-photon 'atlas' of organs and various diseases.